I was at the launch of the Cycle to Work campaign along with the Mayor and the Bicycle Mayor last week. 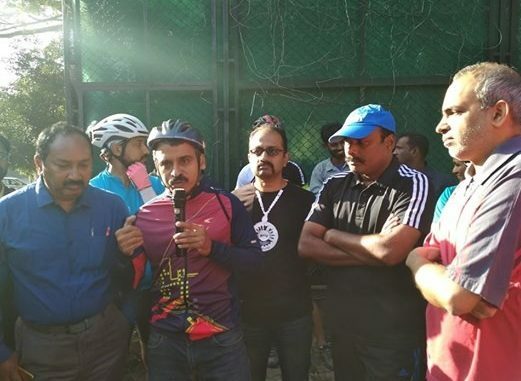 It was very nice to see many cyclists come together, hopeful of renewed efforts to make their commutes and other rides easier and safer. The program is designed to enroll corporates in supporting their employees who cycle to work, and a template for that is being put together. Looking back at lake revival efforts over the last decade, I feel the push for cycling can also work, if I we adopt the key learnings. I offered a few thoughts on this, and was happy to note the Mayor’s immediate acceptance of some suggestions. 1. Some goals can seem daunting and far away, and citizens worry that unless the government is committed, they cannot be achieved. Perhaps, but there is more. Governments don’t have fixed positions on many things, and they also sometimes don’t know what to do. By our involvement and persistence, we can increase the government’s commitment to the things we care about, and also improve the capacity of public administration. 2. Structured interventions help. This means two things in particular – a dedicated Budget to support cycling, and officials in the municipal administration whose only job is to promote cycling. The Mayor agreed right away to both, and that’s a good start. 3. Recognition for good work creates a positive cycle of gains for public goals. There are lots of people who have been doing their part to move the needle on complex problems. We must be deliberate in holding them up as role models and inviting others to emulate them. 4. It helps to think of problems in multiple ways, and give ourselves greater chance of success. In the case of cycling, we must of course seek fair allocation of road space for bikers, but we can also think of a new network for cycling that doesn’t follow the road network. Other cities have done this, with some success. I used to live next to one such trail in Seattle when I was in grad school, and found it sensible that the cycle path was often distinct from the road network. In Bangalore too, something like that is possible. Bicycle paths around the 30 to 50 largest lakes could form the backbone of such an alternative, and we could then work on the connections between them. I Own a Bicycle, Do You?